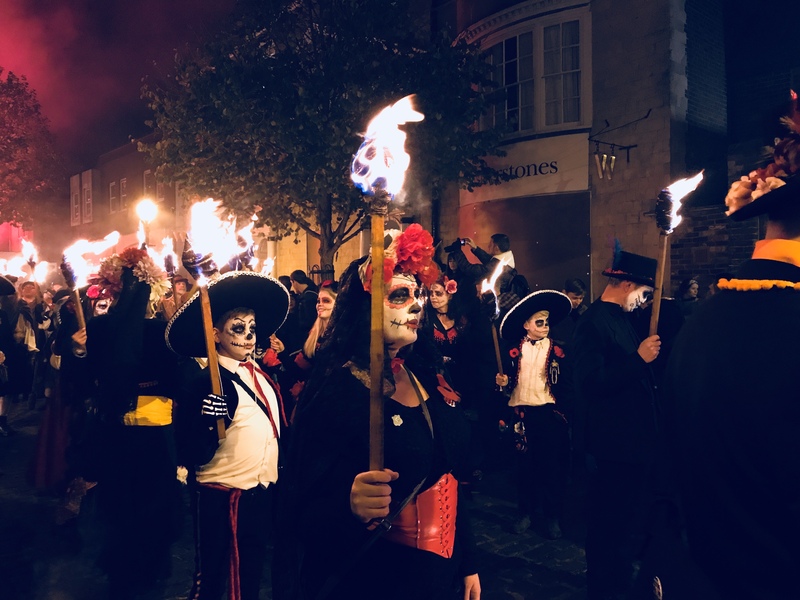 Lewes Bonfire Night had it all. 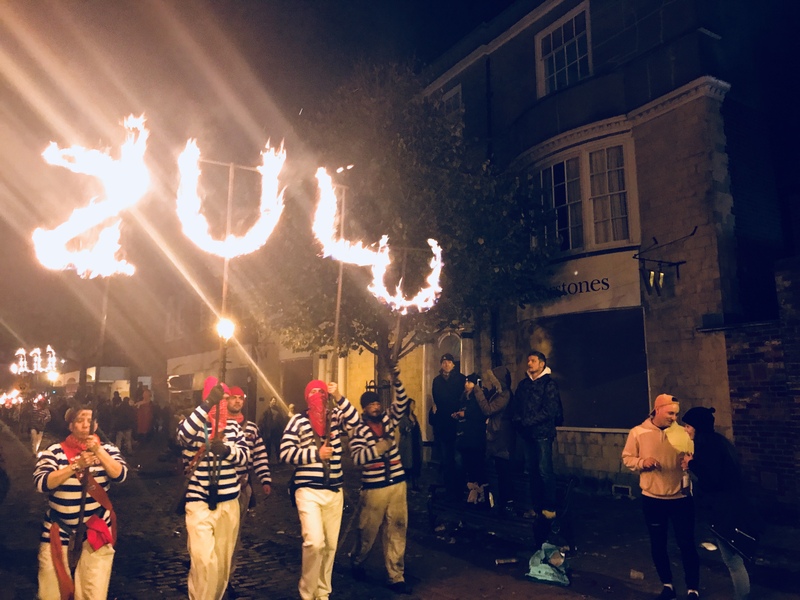 Fireworks, parades, effigies and plenty of bangers! 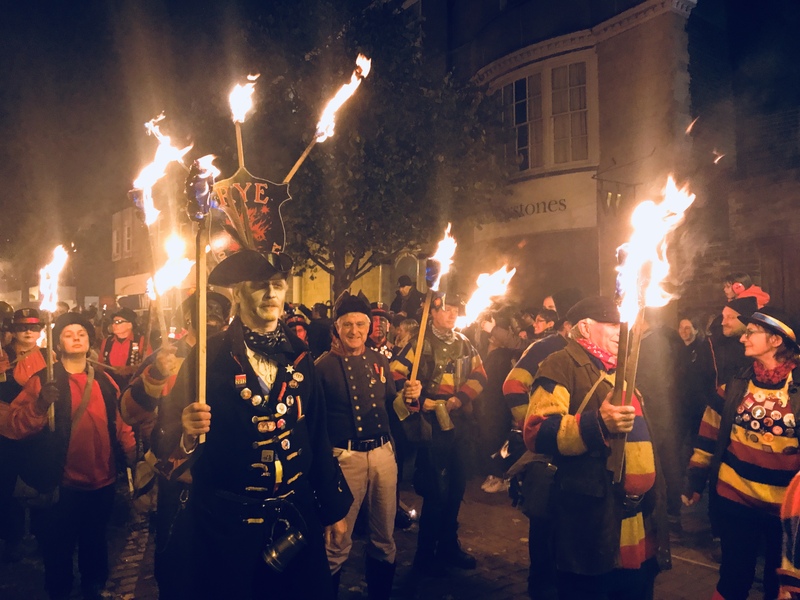 Bonfire societies from all over the south came together to put on the most magnificent parades and firework displays across Lewes. This post is all about my day, what I saw, the history and plenty of pictures for you to look at! 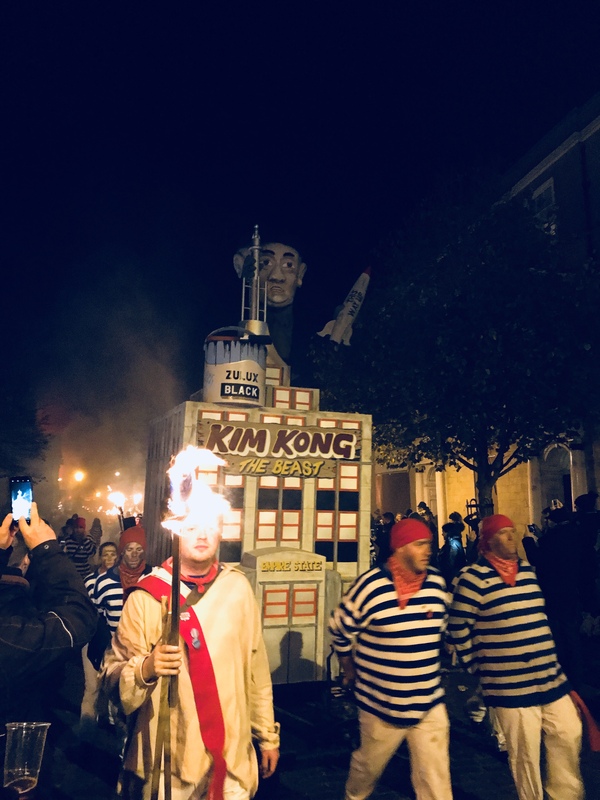 Lewes is one of the biggest and best Bonfire Night celebrations on the south coast. 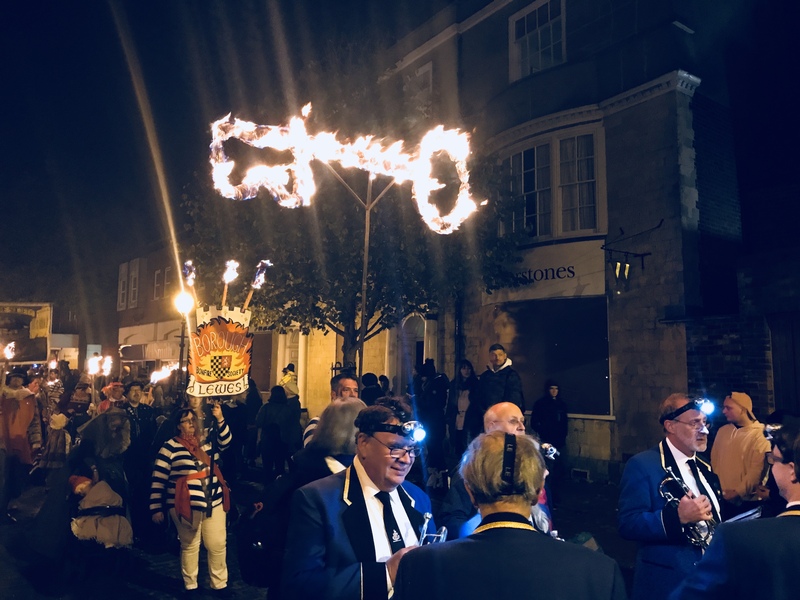 It’s origins are honoured by the Bonfire Societies throughout the evening through costumes, banners, themed firework displays and music. Getting to see this historic marvel is getting harder as the years go by. 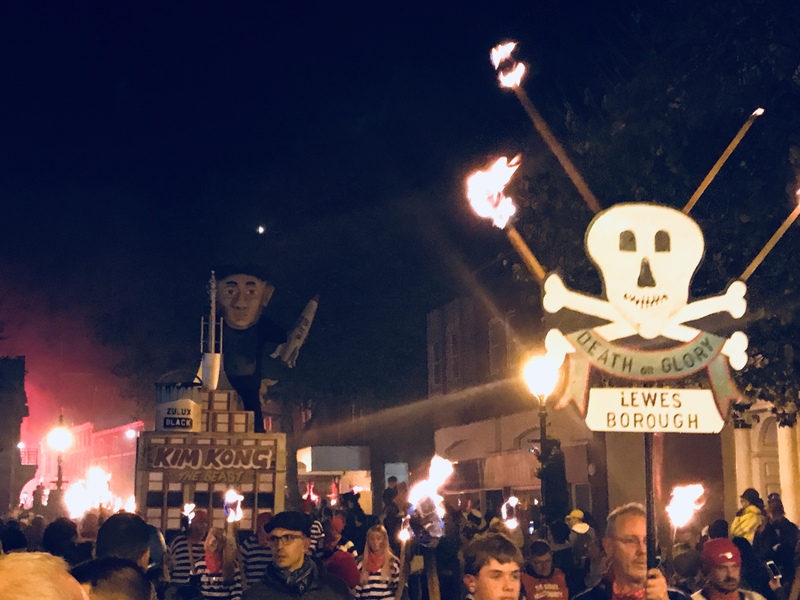 No trains run to Lewes, there are parking suspensions across the town and the roads are closed on the day from midday to 2am. 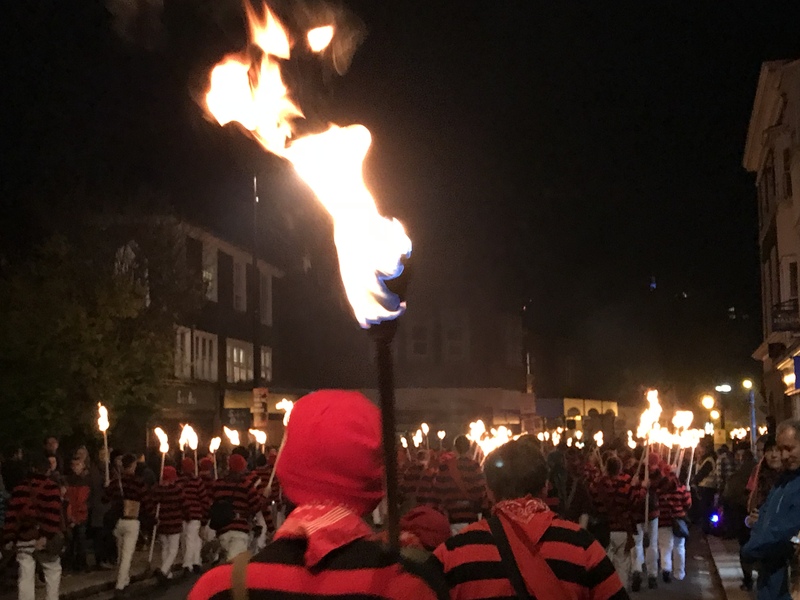 Visitors have reached record numbers over the past few years so there are lots of measures in place to manage the crowds coming into this small South Downs town. 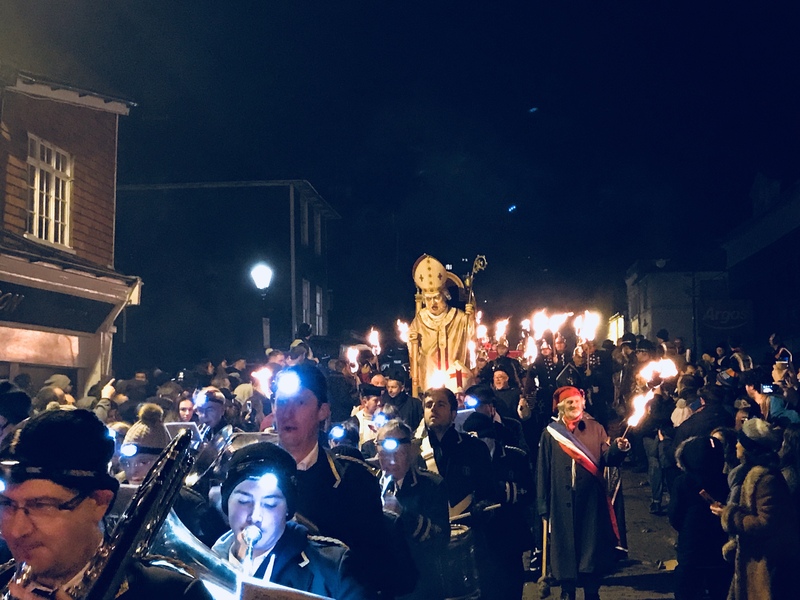 The processions go through the streets of Lewes followed by the crowds! 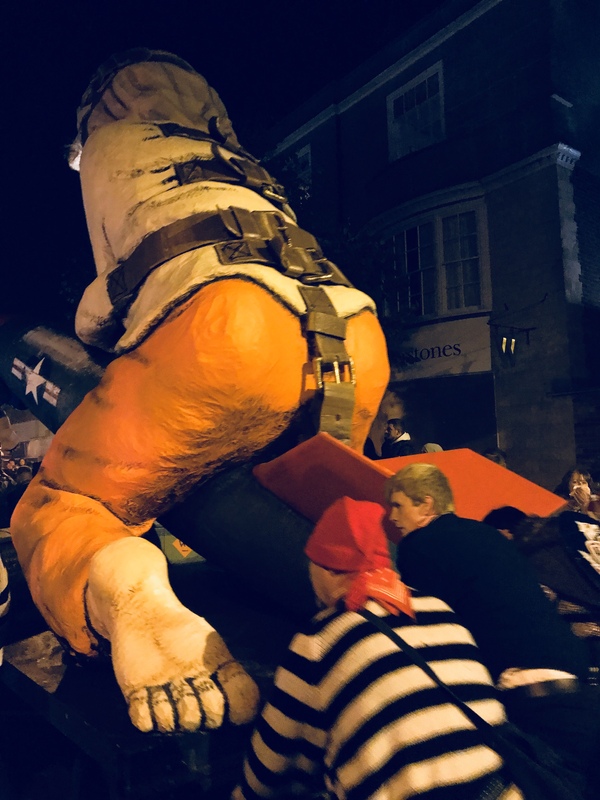 Now I’ve been, I can fully understand why people are attracted to Lewes’ celebrations. They are really special and need to be protected and supported. 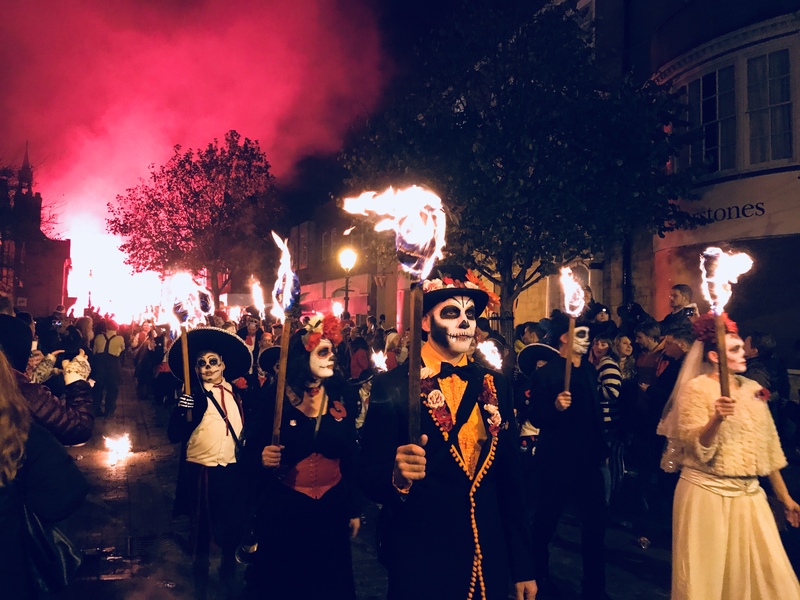 We used to have parades and celebrations in every town but slowly they are dwindling as red tape, health and safety and a lack of financial support is slowly killing Guy Fawkes celebrations off. To be able to tick this off my Mum’s birthday bucket list took a bit of research and planning. We were up at the crack of dawn to drive down from Southampton and get a parking space just outside of Lewes. We then walked in and at the end of the day we had to wait until the early morning to wait for the roads to re-open so we could leave. It was a long old day but, totally worth it! I thought I’d share my pictures with you so you can see what happens on the night. There’s an awful lot of them, they aren’t amazing shots, everything was very dark and people moved very fast! But, the pictures should give you a great idea of what was there. We arrived very early and had the whole day to explore Lewes. 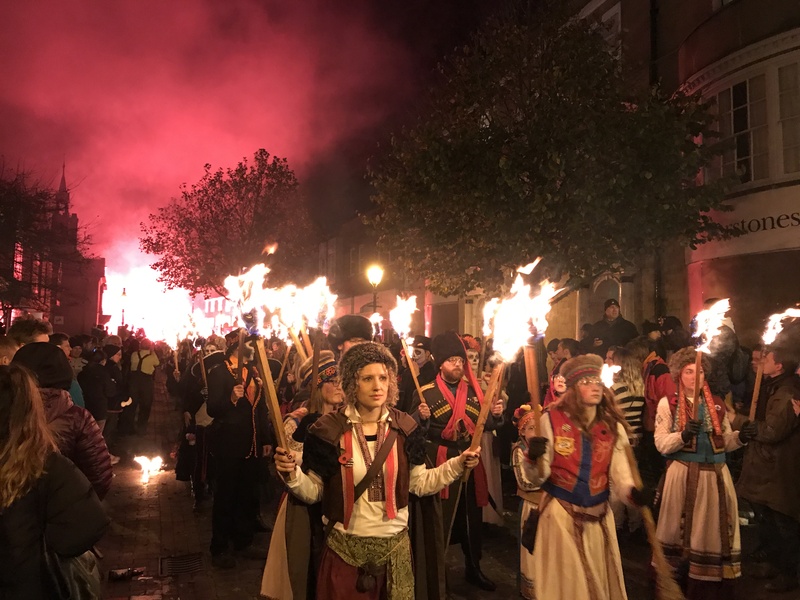 This beautiful traditional town was already very busy with people arriving for the celebrations. Businesses were boarding up their shop fronts and it reminded me of the preparations for Nottinghill Carnival. Lewes is beautiful and very hilly. 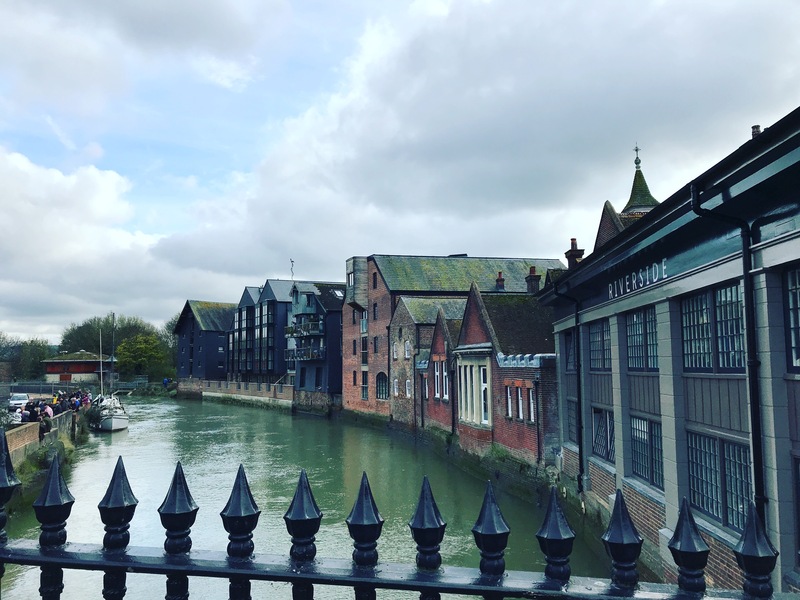 It sits where the River Ouse has cut through the South Downs and has lots of historic buildings still like the castle and a 15th Century bookshop. 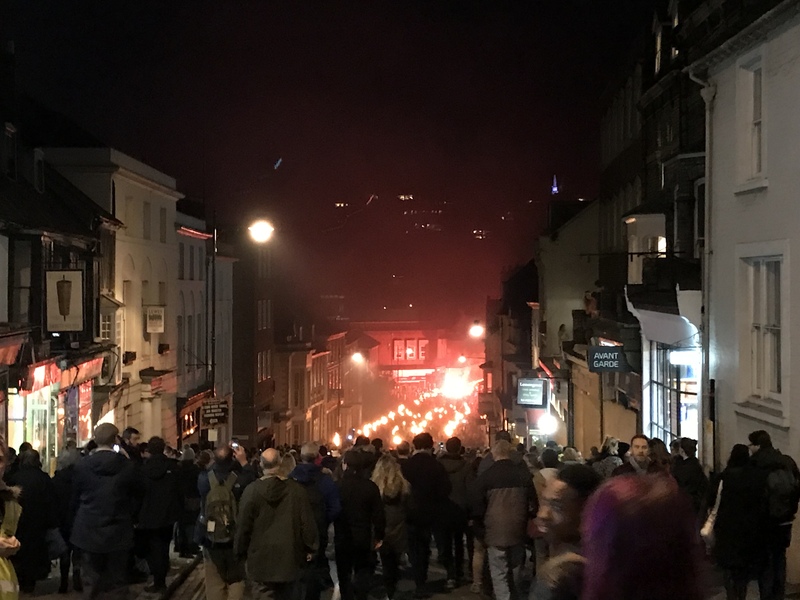 The bridge in Lewes is central to Bonfire Night celebrations. 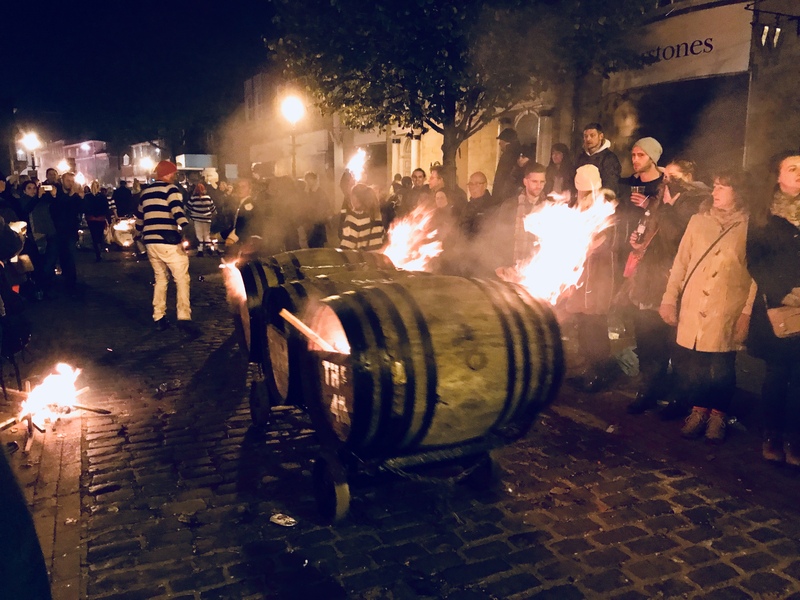 Burning barrels are thrown from it during the evening. There’s also lots of lovely independent foodie places like Riverside, Bake Out and the Flint Owl Bakery. Throughout the day we went to all three! We had tea at Riverside watching the world go by, cheese straws and tiffin cake at the Bake out and bought a cheesy pesto focaccia from Flint Owl for later in the night. That cheesy bread was very welcome around eleven when we’d been stood out in the cold for a long time! It’s safe to say that I ate my way through the day, topping it off with mulled wine from the many independents that stay open throughout the night. It was the perfect start to the festive season! 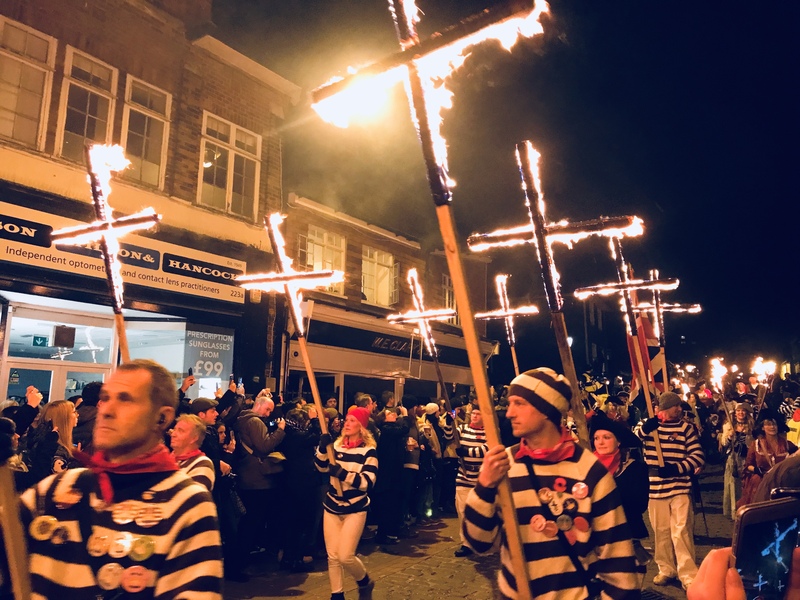 The Bonfire Societies celebrate all aspects of the area’s history from the religious deaths that are the focus of the event to the tributes for our fallen heroes in both World Wars. 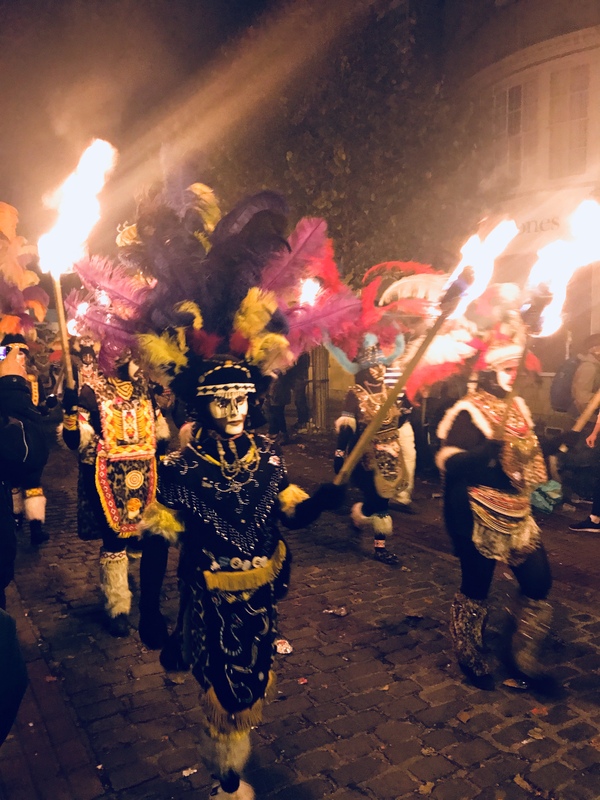 Read my previous post, I’m off to Lewes for Bonfire Night 2017, to find out more about the history of the event. This year was particularly special as the 70 year Zulu tradition, where members black up and wear African costumes, was brought to a close. It even made the front page of The Times! 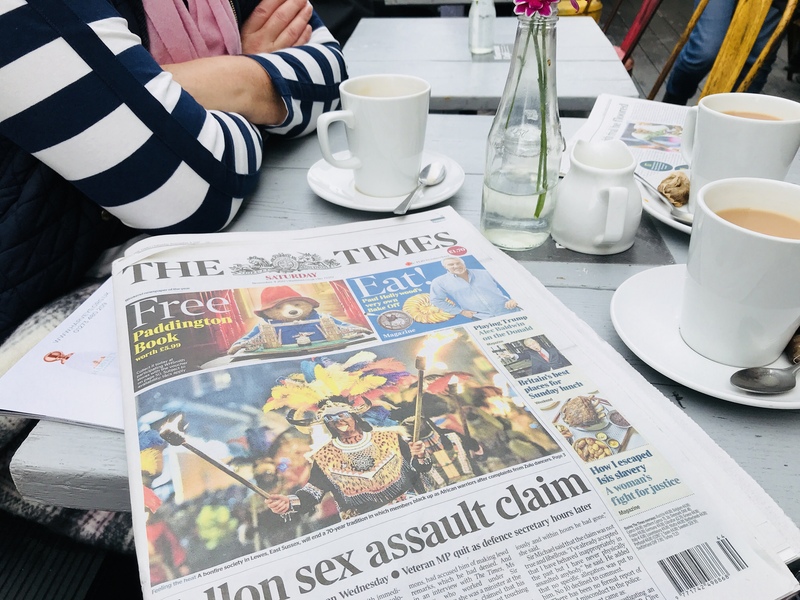 Sat in the Riverside for a bit of tea and what did we spot on the front page of The Times, Lewes! 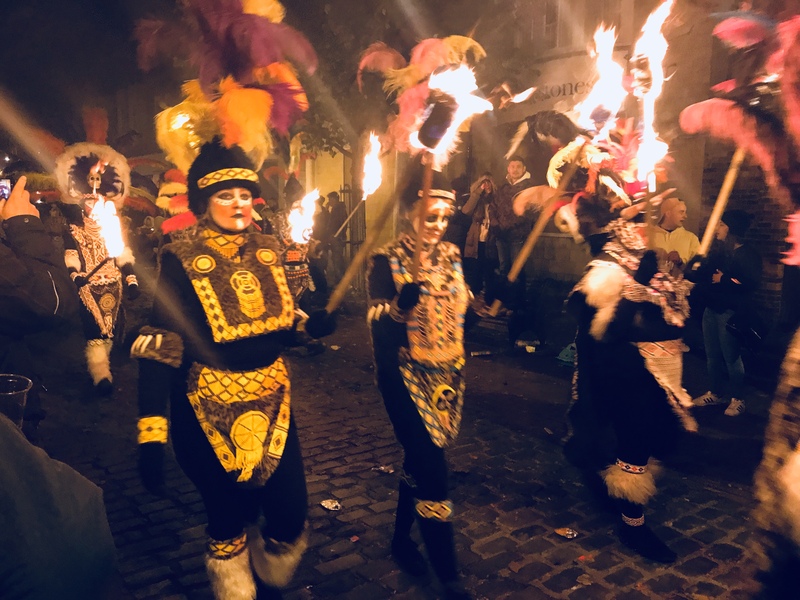 The parades are continuous from about five o’clock right through to midnight. If one society had finished you only waited a few minutes before another was on its way past you. 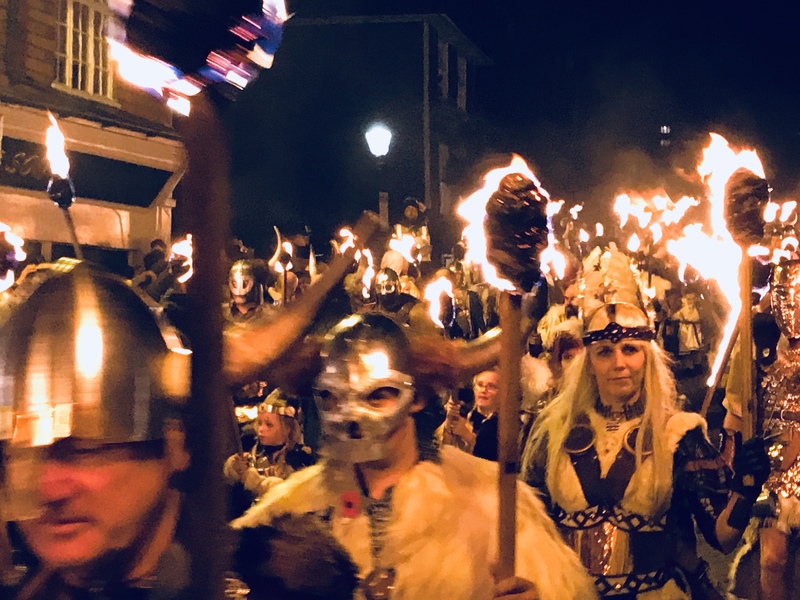 You could tell by the end some of the drummers and torch carriers were really tired after walking through the hilly streets non-stop for at least six hours! Costumes were elaborate and made such an impact. I was gutted not to get any non-blurry photos of the Votes for Women part of the procession. Their outfits were brilliant and they always got a good cheer when they passed by. 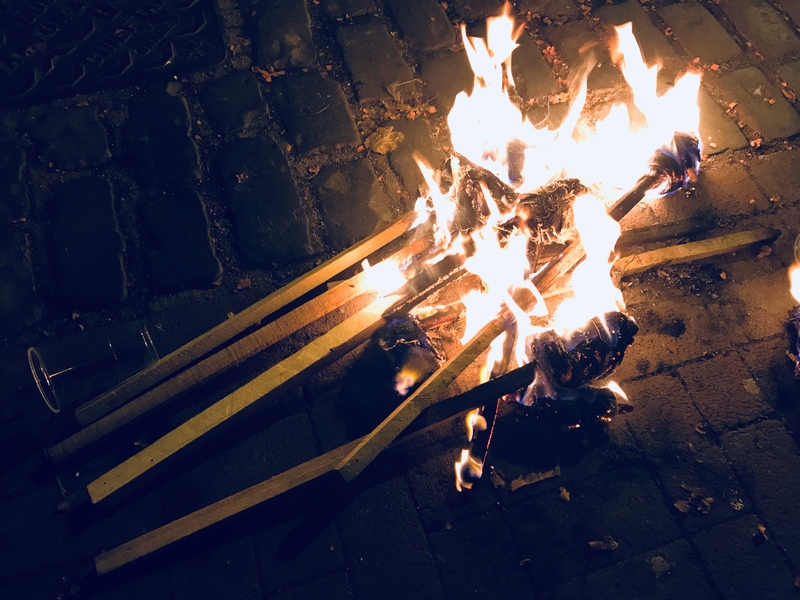 Torches were discarded in the gutter by our feet. A welcome warmth as the temperature dropped! 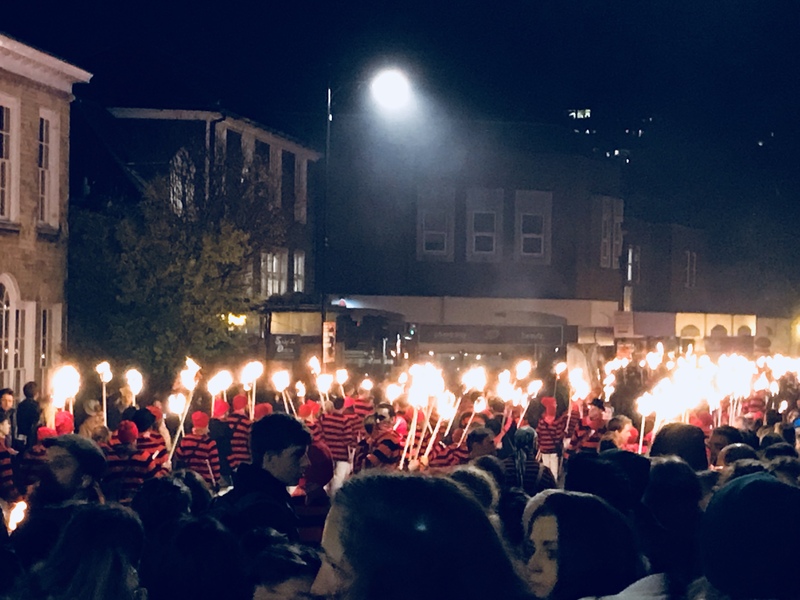 Societies take part from all around East Sussex. 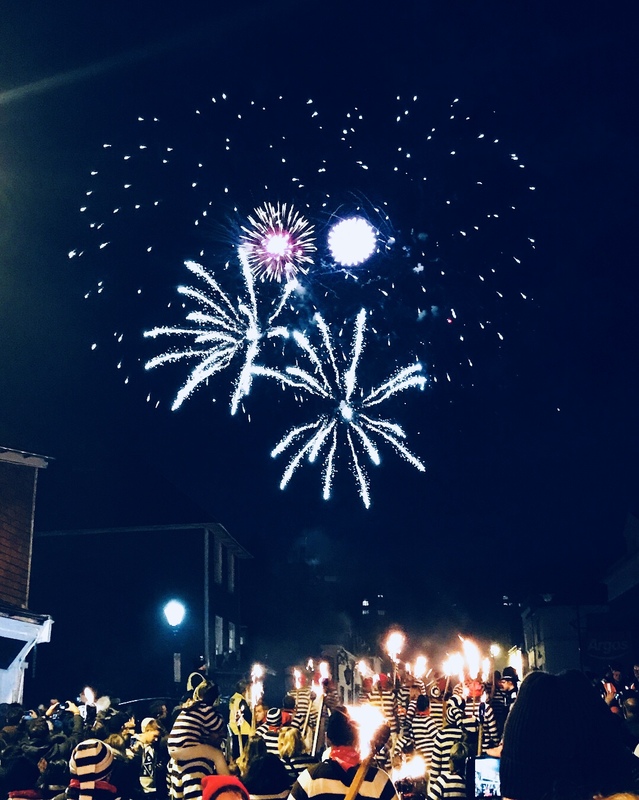 Four host bonfires and fireworks in Lewes that you can attend throughout the evening. 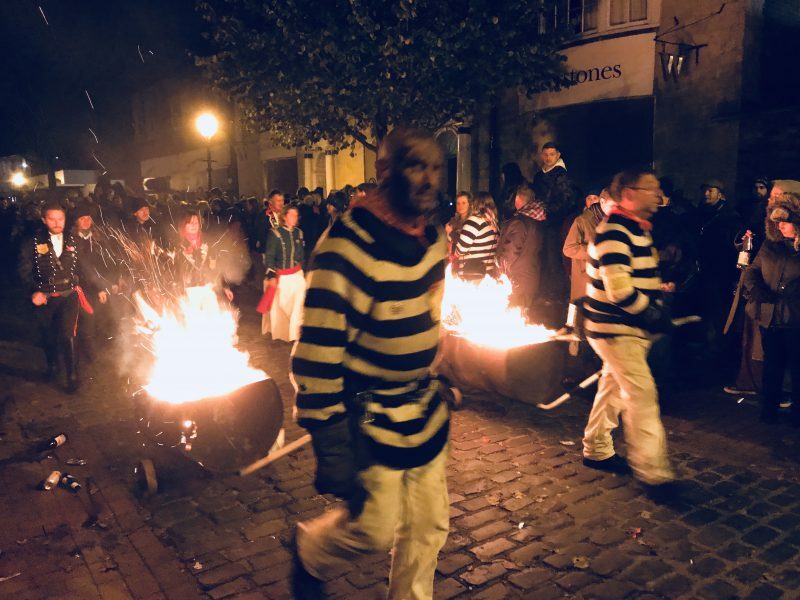 For a break down on some of the societies and the costumes read the Wikipedia entry that tells you what bonfire societies wear and why (scroll down to the right section!). Societies can be identified through the colourful striped jumpers that members wear. 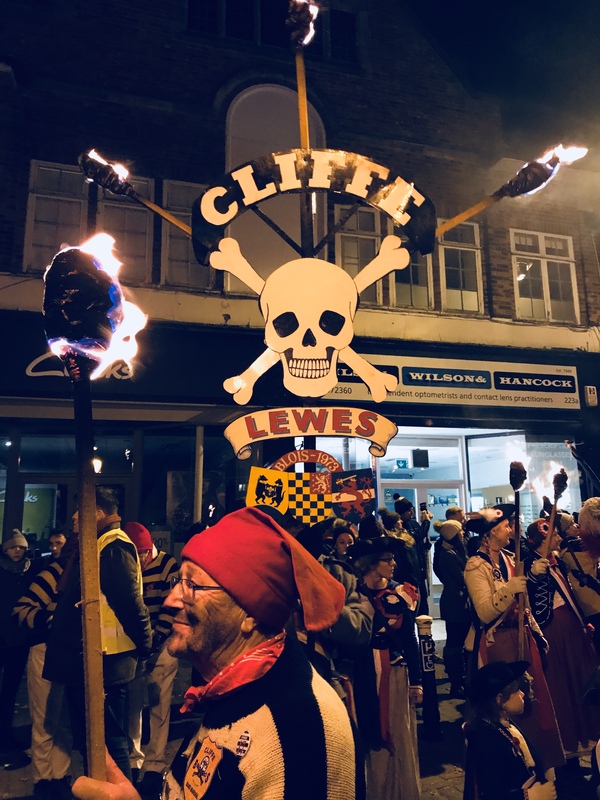 We decided to go to the Cliffe Society fireworks because they are the ones that create the famous effigies and they are one of the oldest societies. Members of Cliffe wear black and white striped jumpers. They were some of the best I’ve ever seen and there were so many of them. I must of seen about seven different displays throughout the evening. 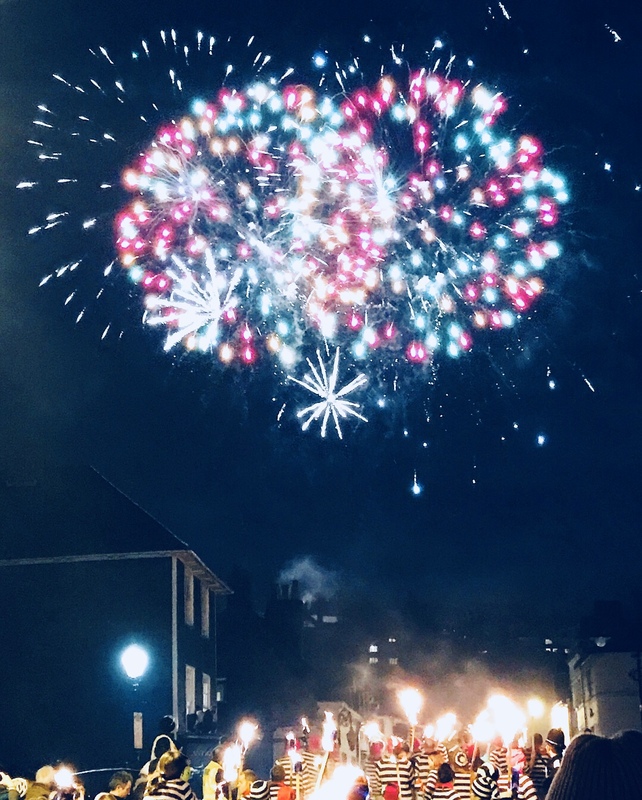 We paid to go to the Cliffe firework display, which I’m really pleased we did. 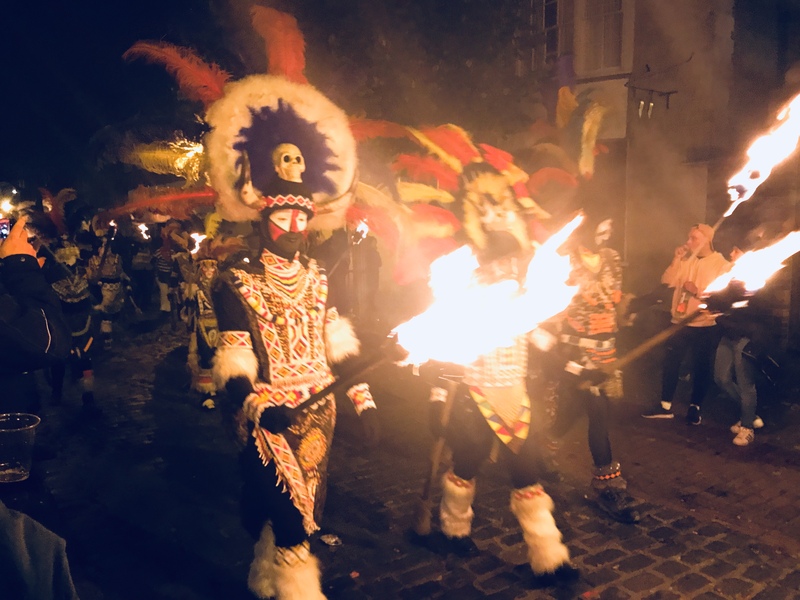 It was timed perfectly around 10pm when they was a break for processions to go to their own grounds and have fireworks. Three sets were running simultaneously and it was like they were having a ‘firework off’, each trying to out do each other. 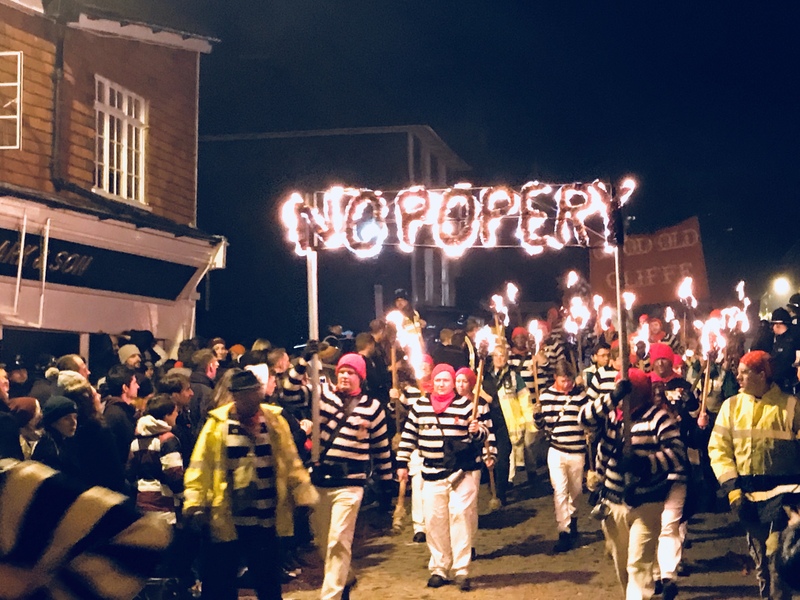 This is one of the most famous parts of the Lewes Bonfire Night. 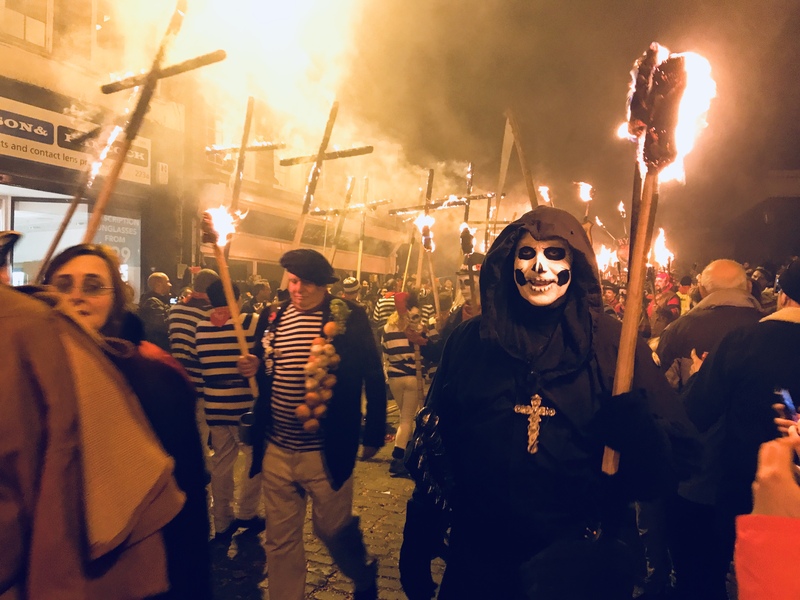 Each year they burn an effigy of the Pope, Guy Fawkes and any ‘enemies of the bonfire’. 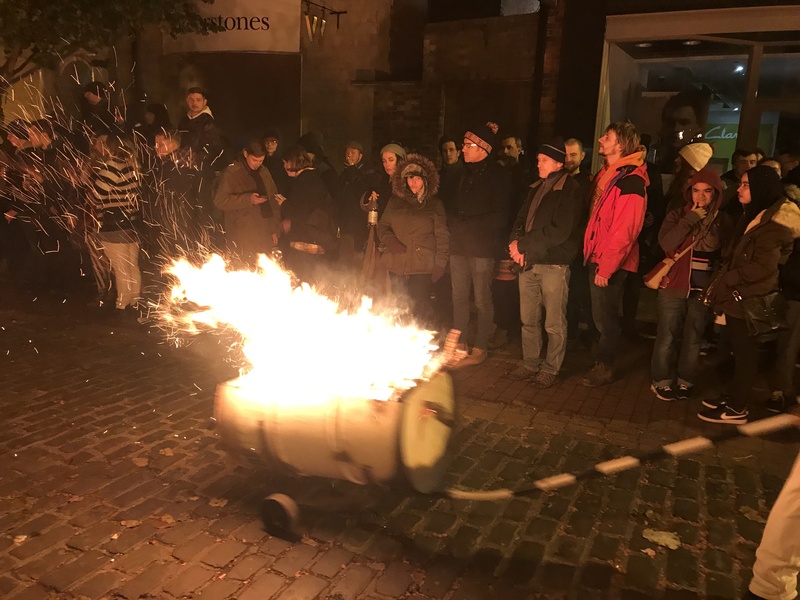 Enemies of the bonfire are celebrities, politicians or any public figure who is doing something not in the best interest of the world we live in. Previous people to fall under this category are Donald Trump, Sepp Blatter, Osama Bin Laden, Vladimir Putin and many UK politicians. 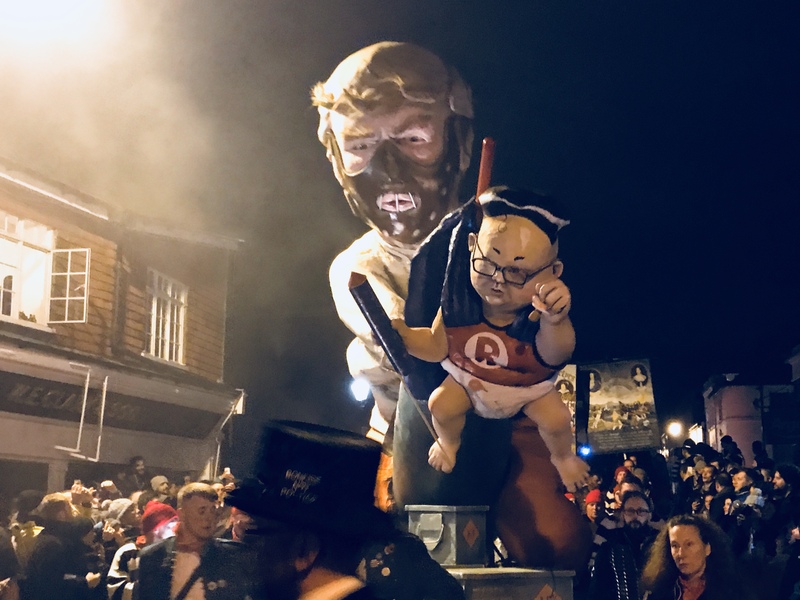 This year Kim Jong-un was chosen and Donald Trump got a second effigy too having already been an enemy of the bonfire in 2016. 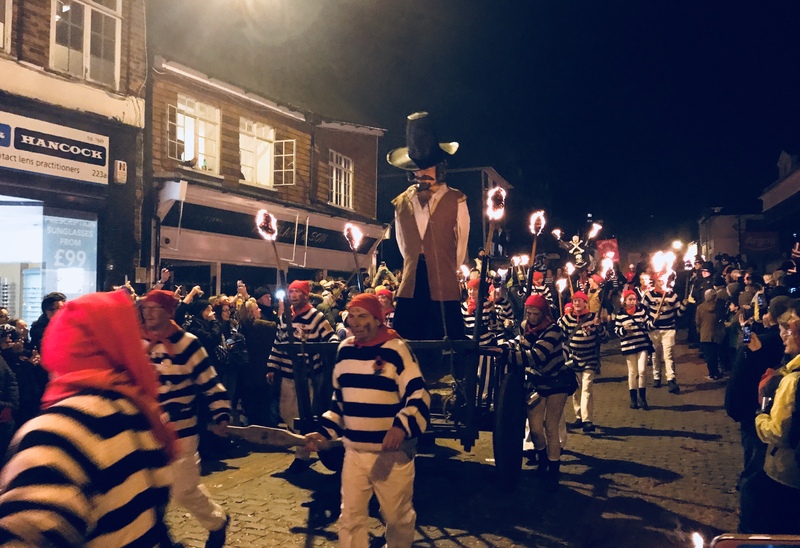 Apparently we missed Harvey Weinstein and Teresa May effigies made by other societies on other streets! 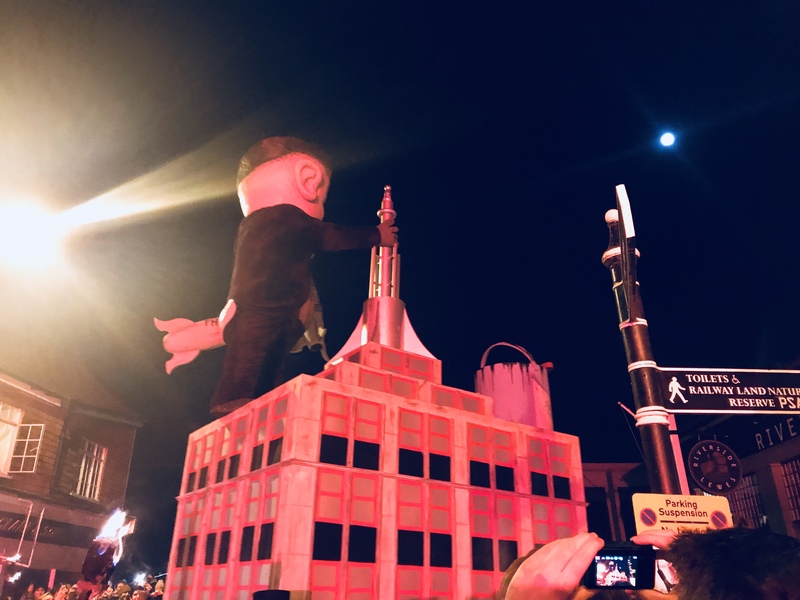 Kim Jong-un’s effigy depicted him as ‘Kim Kong’ on the Empire State building clutching a missile. The effigies are very cheeky! Donald Trump was depicted as Hannibal Lecter with a mask and straight jacket riding a giant missile. 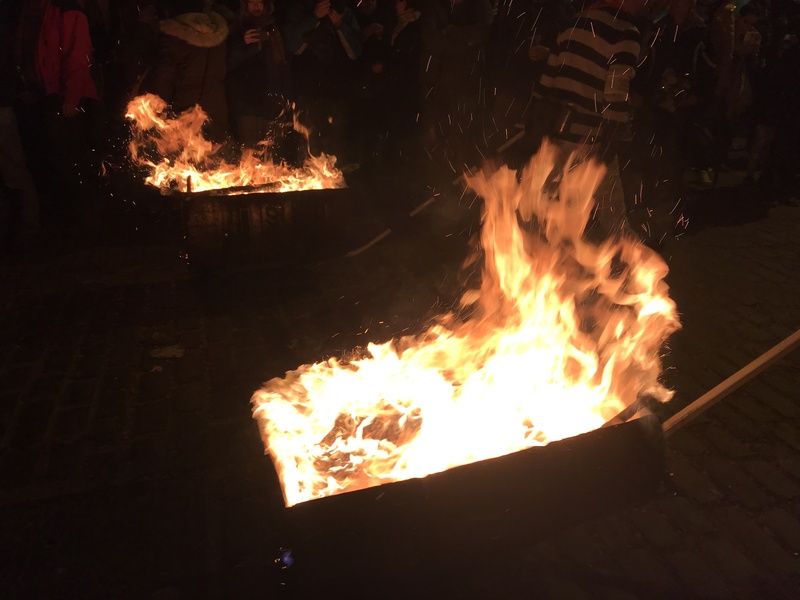 The effigies are burnt and ‘blown up’ at the end of the evening when the bonfire is lit. Some of the fireworks were themed, the Donald Trump ones were all bright orange! 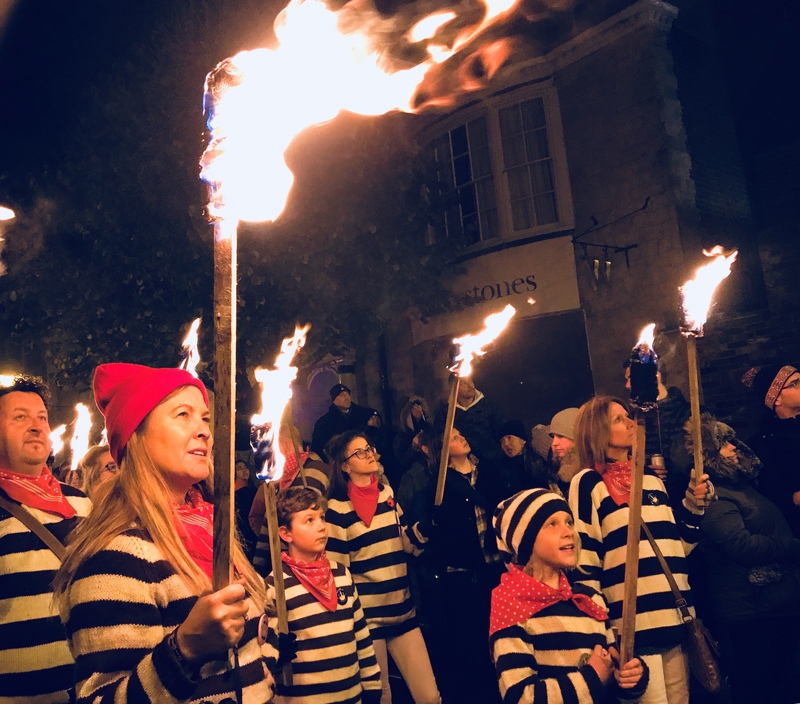 One of the main traditions is the letting off of bangers. I don’t mean one or two either, people in the parade were letting off whole rolls of bangers all the time! For those of you not in the know a banger is a small noisy firework designed to let off a big bang to scare people. There’s not much to see apart from a quick flash of light and some smoke, when lots are let off it looks quite glittery. I haven’t seen them for years in the UK, I think they’ve been banned. 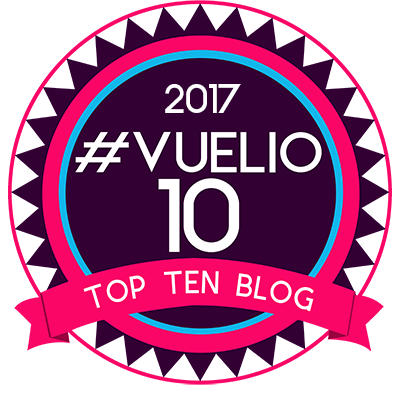 A totally different story if you’ve ever been to Mexico where they are still very much allowed! During the parade I got hit directly on the knee by one, and it packed a punch – I’ve got the round purple bruise to prove it! I’m not sure I can put into words how fun this day was. It was a totally immersive experience and I saw about six different sets of spectacular fireworks throughout the evening. 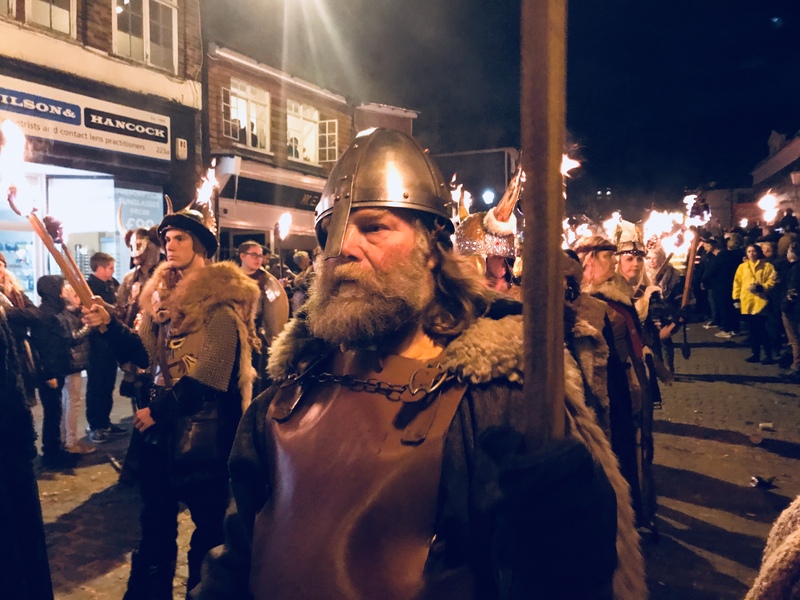 Everyone there was so engaged with the processions, taking part and having a good time. The atmosphere was great and everyone so friendly. We chatted with so many locals who seemed to enjoy sharing their stories and what happens during the evening. Some locals even offered us their sloe gin! The best part was getting to spend it with my Mum and my boyfriend, sharing this experience with them was fantastic. 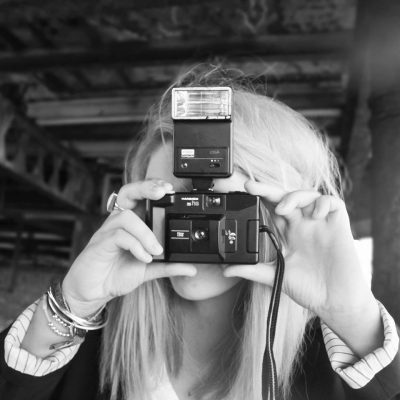 Hope you enjoyed the pictures! What do you think of it? Have you ever been? 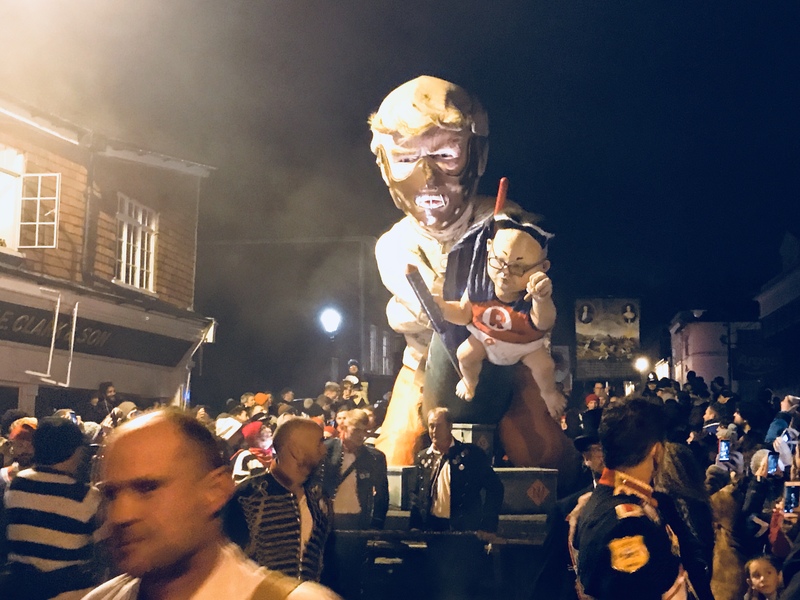 If so, what year and what was the effigy when you went? How fascinating. A really interesting celebration. Yes, people were there from all over the world to see it. Thy are trying to make it very difficult for people who don’t live locally to attend. The trains are shut for five stops around the town and there is literally no parking anywhere across the town as all parking is suspended. It’s a mega cultural thing – I’m not sure how it’s survived. 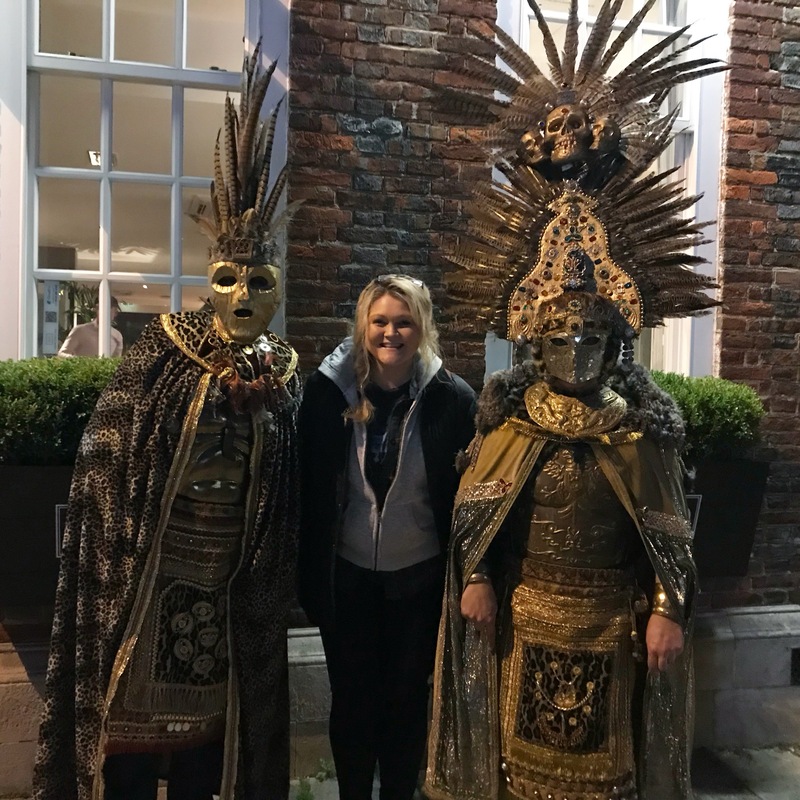 It was brilliant – one to tick off the bucket list! Do you like travel Tony? I want to go!!! thanks for sharing. 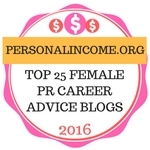 And thank you for following my blog. You’re welcome- if you get the chance it’s definitely worth the travel hassle!